This entertaining and quite dark Mel Gibson movie finally arrives on Blu-ray but gives the viewer a unique twist to the original 1967 novel called "The Hunter" by offering both the original theatrical release and the director's cut which was quite interesting to watch and there are some huge noticeable differences. The story revolves around a professional thief called Porter (Mel Gibson) who is double crossed by his wife (Deborah Kara Unger) and his "friend" Val (Gregg Henry). Although his wife and friend believe that Porter is dead, he miraculously recovers and his revenge fuels his fire for recovery plus the money they stole from him. Starting from the bottom of the rung in the criminal world, Porter eventually gets back on his feet and as the old saying goes, revenge is a dish best served cold in this interesting action drama. In relation to the two different interpretations of the movie, the theatrical version features more black comedy, whereas the director's version is a much darker interpretation and interestingly enough the characters are a little less likeable with a higher amount of violence as opposed to the theatrical version. It's a great parallel and obviously Hollywood decided that the director's vision was a little too dark for mainstream viewers which seems a little true but it's definitely worth watching. The video quality on Blu-ray supports 1080p, however due to the age of the movie, it's a little grainy but nonetheless, the images are sharp and the colour palette, although muted at times suits the story quite well. The sound quality is quite decent with Dolby Digital 5.1 and there are a few impressive surround sound moments in the movie. When it comes to extras the movie contains some interesting featurettes regarding the behind the scenes of the movies, interviews and some fun blooper scenes which is always entertaining to watch. 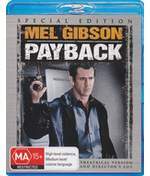 At the end of the day, Payback is a fun movie that contains some strong performances by Mel Gibson, Maria Bello, Lucy Liu and James Coburn who really get into their characters.